Kurt of Gerolstein: Little Buttercup .... my best shot! It’s Buttercup day. 8am on a glorious Yambanic morning and it’s time to put the tale of Harriet(te) Everard on paper … yes, I know I promised it yesterday, but she threw up the odd hiccough and I spent most of yesterday failing to sort one of them out. However, with ‘Miss Everard’s twenty years as an actress and a singer on the British stage, I have no problems, so here we go. EVERARD, Harriet[te Emily](née WOOLLAMS) (b 96 High Street, Marylebone, London, 12 March 1844; d London 22 February 1882). The first child of John WOOLLAMS (b London 1 August 1816; d 66 Preston Rd., Brighton 28 August 1884) ‘builder and paper stainer’ and Harriet née GRAVES (married 1843). 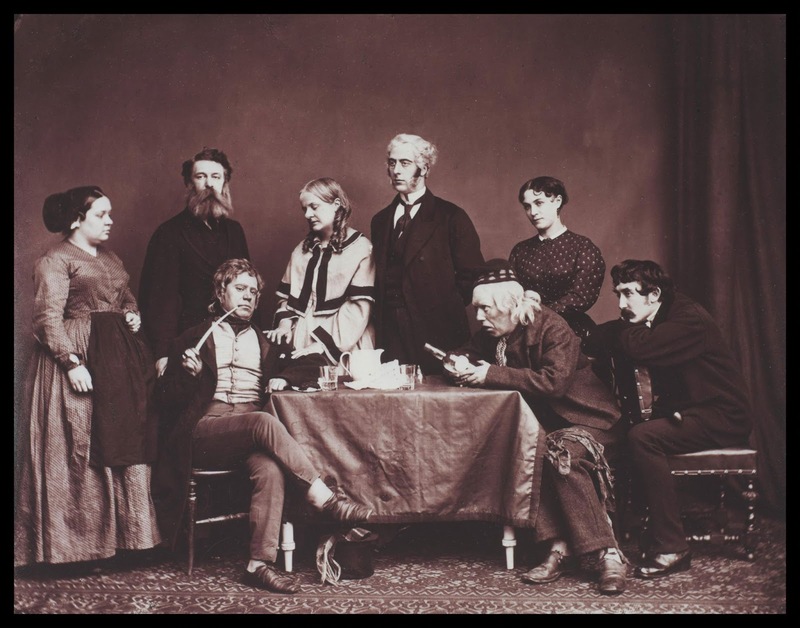 Seemingly brought up by aunt Emily and her husband, goldsmith Frederic Aumonier (1801-1860) at 754 Old Kent Road, while father and mother were producing Adela Louisa, Percy Raynor, Walter John, Kate, Alma, Maude .. It is said that Harriette began her stage career at Exeter with actor-manager Frederick Belton. Yes, I see that. But it is not quite evident when. Some say 1860. Belton opened his theatre 26 November 1860 with a company including the Misses Bella Vaughan (leading lady), Julia Leicester, Fanny Raynor, Annette Howell (dancer), Mrs H Somerville and Mrs Alcroft. A future star in Harry Beckett was amongst the ‘also’s. But the theatre seemed open mostly to let the military amateurs of the local Volunteers strut their stuff, and come panto time Harry Beckett and the two star ladies seemed to play the opening almost all by themselves. Belton plugged on through short or shorter seasons: I see Fanny Addison and a Mrs Bathurst taking a turn … For the winter season, Mr Belton scored a small coup: Charles Kean and wife came to his theatre 27 November for three performances. The brought three supporting players with them, but they played large plays, so Mr Belton hired his ‘winter company’ in consequence. First a ‘Miss Elise de Courcy’ was brought out, then the pantomime Aladdin and a Miss Plucknett and amid a host of musical and burlesque performances comes a notice for the ‘beautiful singing’ of Miss Everard in Guy Mannering. I spot her is Miss de Courcy’s Benefit (18 March 1862) before Mr Belton moves on to manage the Swansea Theatre for a season. And Harriet went too. I see her singing ‘May pretty Jane’ between the parts (‘in a style that commanded an encore’), and I see her playing in Rob Royopposite the company’s first singing man, Maurice de Solla (‘the singing of Miss Everard is much admired’, ‘really a great favourite here’). From Swansea, she and de Solla continued to Plymouth, in October, to repeat their Rob Roy and remained there as part of the strong local company until Easter the following year (Pekoe in Aladdin, Abriocotina in Ruy Blas, Fortunio etc). I don’t know what happened next. She was strongly established in a fine provincial company, there was talk of her going to Cave at the Marylebone … but for the rest of 1863 she is unfindable. Ill? Pregnant? Family problems? Or just unemployed? Anyway, she surfaces in the new year at the second-rate Surrey Theatre in Sheffield, singing ‘The Chink of Gold’ in Sinbad and giving Guy Mannering and Rob Roy with de Solla. I notice among the alsos of the company a Mr Parry. It is Mr Parry who is my timewasting problem. From Sheffield Harriette progressed to Jersey’s Queen’s Assembly Rooms for a summer season. It wasn’t quite as end-of-the-pierish as it might so, foe the two principals of the affair were tenor Elliot Galer and his wife, known as Fanny Reeves. They were both well-known English operatic performers, but Galer had had a bad accident and they were now touring at Entertainment of two-handed operettas which they had recently been performing in London (Cousin Kate, The Haunted Mill, Blonde and Brunette etc). 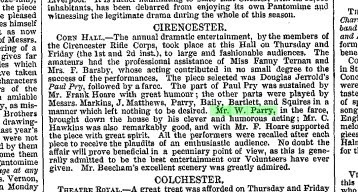 For their summer season they hired two supernumeries: Hariette and ‘Mr W Parry’. ith a finely developed figure’ ‘displays talent as both a vocalist and an actress’, ‘so melodious a voice and with such brilliancy of expression’ ‘a decided success’), was the comedy relief as Cordelia Jemima in the drama Love’s Martyrdom and created the rather approximate version of Clémentine in the first approximate version of the opéra-bouffe Barbe-bleue. She was already marked out as the coming Desclauzas of England … at twenty-one! In 1867 she played a season with Miss Marriott at the Victoria Theatre (Jeannie Deans, The Hunchback, Hamlet, The Broken Sword, Raymond and Agnes, Tricks of the Turf) and then visited Liverpool, for another at the local St James’s Hall with Maria Simpson. She was Mopes the maid in Pygmalion, Princess Bariatinski in Ton Taylor’s The Serf, Mrs Raby in Miriam’s Crime and created the elderly, flirtatious Marchioness in a burlesque of La Fille du régiment, La Vivandière, by one W S Gilbert. Then, after a brief return to Greenwich, she was hired for the Queen’s Theatre: manager Alfred Wigan. Only, Wigan was but a front. The Queen’s Theatre was a lust-gift from Henry Labouchère to his married mistress, the actress Henrietta Hodson of historical infamy. Miss Hodson played endless juvenile leads at the Queens, and either enormously cannily or blithely unaware that she was being acted off the stage, surrounded herself with a most amazing company: Li Brough and Johnny Toole as chief funmakers, the young Henry Irving, John Ryder, even for a while the delicious Polly Markham and the rising Kate Santley. And Harriette as comic soubrette and old woman. She played her Marchioness in Gilbert’s burlesque again (‘cleverly represented without too much exaggeration’), was Mrs Corney to Brough’s Bumble, ‘an intriguing lady of a certain age’ ion The Gnome King, Mrs Spriggins in Ici on parle français, Polly in Not Guilty, Mrs Fielding in Dot, Mrs Subtle in Paul Pry … in the eighteen months that she stayed at the Queen’s ..
Henry Irving, Miss Everard, Charles Wyndham, Ada Dyas, John Clayton, Henrietta Hodson, Toole and Lionel Brough in Dearer Than Life at New Queen's Theatre. 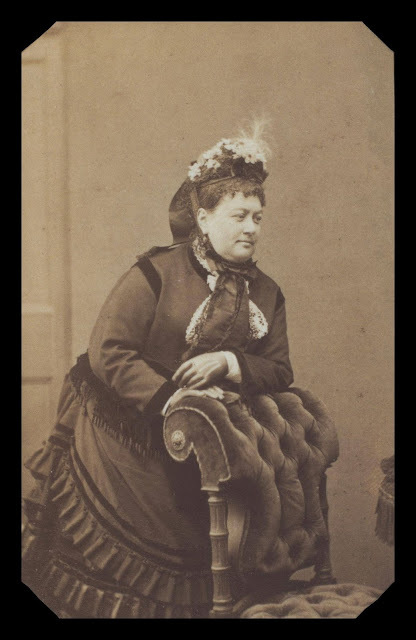 She fulfilled a season at the Royal Alfred Theatre in 1869 (Hectae in Macbeth, Bleuzabella in The Invisible Prince) before she landed another substantial engagement, in Mrs John Wood’s company at the St James’s Theatre and on tour. Mrs Wood played a good repertoire (Milky White, Bombastes furioso, The Heir at Law, Paul Pry, To Oblige Benson, the burlesque Vesta) but her trump card was the burlesqueLa Belle Sauvage. Matilda Wood, of course, played Po-co-han-tas (as John Brougham’s piece had originally been named) but the show had been rewritten since its first productions and was now a burlesque of the hit play School. Harriette was the schoolmistress Kros-as-can-be: ‘one of the most genuinely grotesque parts on the modern stage. A sort of French bonne in German style …’. She all but stole the show! She returned to Ms Hodson for The Last Days of Pompeii, she joined an aspiring Edith Bertram at the Royalty Theatre for a month as a garrulous landlady in Bohemia and Belgravia and Mme Deschapelles in The Lady of Lyons and even joined the cast – alongside such as Lionel Brough, Mrs Billington and Mrs Howard Paul, no less, for the disastrous spectacular Babil and Bijou at Covent Garden. In 1873 she appeared at the North Woolwich Pleasure Gardens, and then moved to the Princess’s Theatre where she appeared as the Spirit of Memory in Undine, The Will of Wise King Kino, Griselda., The Sleepiong Draught, as the Fairy Minette, Queen of Catland in Little Puss in Boots singing ‘How nice to be a fairy’ and voted ‘one of the best things in then pantomime’ ‘a very buxom and substantial fairy’.. When Mrs Rosby guested she also played the Duchess of Norfolk in Twixt Axe and Crown. She was cast to the hilt, again, when French opéra-bouffe with its unequalled combination of burlesque humour and fine singing raised its head. When Charlie Head floated an English Giroflé-Girofla at the poor old Phil, with the starry Julia Mathews in the dual title-role, Harriette was given the superb ‘heavy lady’ role of Aurore, and won enthusiastic notices. Unfortunately, the following La Fille de Madame Angot didn’t have an equivalent role available – Desclauzas had still been not quite too buxom the make a triumph of the star role! Harriette was not exactly Rubensesque … more short and plump! When the Phil did The Waterman, she was Mrs Bundle. In 1875 she appeared at the Charing Cross Theatre in comedy (Mrs Toodles, Mrs Wellington de Boots etc), played Mrs O’Kelly in Lodnon’s first The Shaugraun at Drury Lane, in 1876 played in Gilbert’s Pygmalion and Galatea at the Alexandra Palace and returned to the Charing Cross to play Mrs Winkle in Young Rip van Winkle and Mrs Grimley in 20 Pounds a Year. 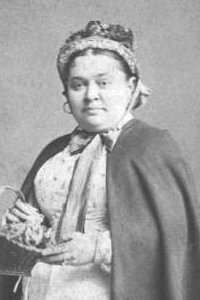 She toured with Joseph Eldred, played with the Strand Theatre co ..
And then she was hired to play Mrs Partlett, the pew opener, in the new British ‘opéra bouffe’ at the Opera-Comique. It was a triumph for her (‘Miss Everard was excellent as the pew opener’,‘the incomparable pew opener of The Sorcerer)’ but it was also probably the death of her. There is no need for me to repeat the tale of Harriette’s career from here on in. It is too well known. From The Sorcerer and its companion The Spectre Knight, she went on to the role of Little Buttercup, especially written to feature her (Mrs Howard Paul was to have been Hebe, and Buttercup the second character lady) and wrote herself into history. And then came The Pirates of Penzance. The role of Ruth was played originally (in America) by Alice Barnett. Miss Barnett was very tall and decidedly Amazonian. In London, it was to be played by lovable, roly-poly Harriette. It wasn’t, of course, because she suffered the rehearsal accident which effectively ended her career and maybe her life. What would have happened had Miss Everard lived? She was ‘A’ team. Would the Savoy character ladies have been modelled on her rather than on Miss Barnett? Lady Jane, Fairy Queen, Katisha? The Savoy Operas might have been somewhat different in layout and form to those we know. I’d better tidy up the ends. Harriette married (again) a gentleman – well, a commission agent -- seven years younger than she by name George William Darley Beswick. The marriage was, of course, of short duration. He remarried after her death, but died himself 6 July 1904. I can’t find him (or her) in the 1881 census. But I haven’t looked hard. As for the brothers and sisters, the Woollams family were the delight of the Hammersmith, Brook Green and Richmond amdrams for years, before both Percy and Walter turned professional. Adela didn’t, but after a curious marriage (yes, another) to a chap called Paul Xavier Hubert who was supposed to be a naval attaché from Livorno, but seems to have been the son of a Woollams Wallpaper employee, second-wed one William Lauderdale Maitland. Mr Maitland was a florist of Irish sources, and he too had been involved in showbiz. Under the pseudonyms of ‘the brothers Mansell’ he and brother Richard had been responsible for bringing the ground-breaking opéra-bouffe Chilpéric to England! The story of which I have told at length elsewhere ..! Oh, William was the smart brother who got out of the theatre and back into flowers. Richard was the mad one ..
Super! Thank you for that. I don't suppose you have a year when the "second" marriage took place?